The densely populated city of Lagos has slowly emerged as the commercial capital of Nigeria. Nigeria takes pride in holding bilateral business ties with several countries of the world and ripe for new business ventures looking to gain a hold in the region. Lagos as the infrastructure to support a number of business ventures and is highly conducive to establishing new businesses and has created a demand for trained professionals looking to carve a niche for themselves in their specialty. To help professionals stay relevant, KnowledgeHut offers a number of online learning opportunities for beginners and professionals alike, and CSD Certification in Lagos is a great investment for individuals keen on becoming a certified scrum developer. The e-learning modules offered as part of the course are aimed at facilitating candidates to fully understand concepts and gain mastery over techniques in the scrum framework. The Certified Scrum Developer Training in Lagos is a course that is highly sort after by software professionals looking to work in the scrum framework. The CSD Training in Lagos is also a useful certification for professionals who are already employed and face the constant necessity of updating themselves with the latest developments in the scrum framework to stay employable and competitive. The certification training provided by KnowledgeHut will go a long way in transforming you into a valuable asset for your organization. 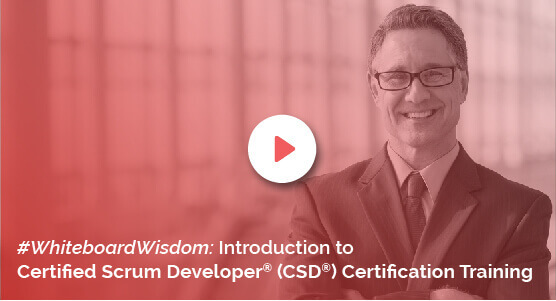 The CSD Course in Lagos provides online training that will give candidates a definite edge with respect to knowledge and skills as a certified scrum developer to stay ahead of the curve. The formal training provided to candidates assures that they will stay highly competitive in the employment scenario. KnowledgeHut courses are equipped with world class faculty, an interactive learning environment and online resources that are made available at all times. The Certified Scrum Developer Certification ensures your access to world-class training at a reasonable price. The CSD Course in Lagos comes equipped with intensive training that will allow you to pass exams on the subject with relative ease. The KnowledgeHut course for scrum developers is a great investment and is a must for individuals seeking to make their career as a certified scrum developer.